2016 Domaine Rimbert, Saint Chinian Rouge “Le Mas au Schiste” Languedoc, France. Jean-Marie Rimbert, a “Carignaniste” for being a staunch supporter the Carignan in the Languedoc’s Saint Chinian region is one of the area’s most renown and a benchmark producer, crafting organic wines from the Berlou Cru, a highly regarded site due to its high elevation and it’s mineral intense brown schist soils that mark these terroir driven wines from steeply terraced vines. If there ever was an iconic producer, Rimbert is without a doubt one of them, his AOC bottlings can be profound experiences, plus he has a wonderful humble nature and wit, he also makes playful Vin de France wines that are gut busting funny and good, especially his Cousin Oscar, a 100% partially carbonic Cinsault that is named for a randy woman chasing relative, it’s become a cheap cult classic! Back to the top wines, the two that stand out are Rimbert’s Saint Chinian Rouge “Les Travers de Marceau” which is all tank raised and includes some chewy/dense Mourvedre along with a core of Carignan, Syrah, Grenache and Cinsault, plus this neutral wood aged “Le Mas au Schiste” it’s made from old vine Carignan, Syrah along with some Grenache, it showcases the soils and has a bit more textural feel from the 10 months in wood. 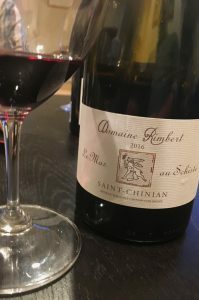 This 2016 Rimbert Le Mas au Schiste is wonderfully ripe and deeply colored with a pretty purple/garnet hue in the glass with a mix of violets, earth, flinty/mineral and blue fruit leading the way on the nose and entry with layers of blueberry, plum, black cherry and marionberry on the medium full palate along with snappy herbs, chalky stones, pepper, cedar, acacia flowers, anise and a touch of rusticity. There’s so much to love here, and it’s clearly detailed with an inner brightness making it an entertaining and impressive Rhone like red, it is drinking superbly now and should go another 3 to 5 years easy, most likely even longer.